On Jan. 29, the American Association of State Highways and Transportation Officials’ Council on Active Transportation will conduct a free one-hour webinar on bicycle and pedestrian project planning. Ben Ehreth and Steve Mullen from the planning/asset management division at the North Dakota Department of Transportation will provide an overview of an effort their agency initiated last June to create temporary demonstration projects, or “pop-up” projects, that represent a “community approach” for determining desired types of long-term changes for safer streets and healthier, more vibrant communities. 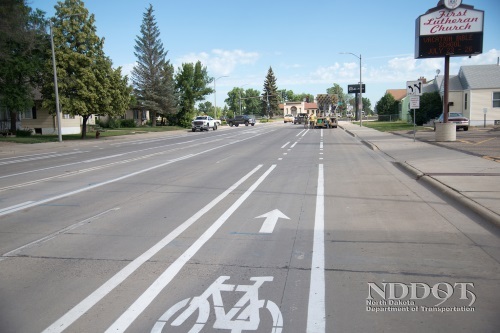 NDDOT will discuss the “positive outcomes” and lessons learned from those pop-up projects and how they influenced North Dakota’s statewide active and public transportation plan, ND Moves. Jackie DeWolfe, director of sustainable mobility at the Massachusetts Department of Transportation – a position created nearly two years ago to enhance multi-modal transportation options – will discuss the agency’s new Statewide Pedestrian Plan, Statewide Bicycle Plan, and companion documents, as well as how projects originating from those plans were implemented and the metrics involved in measuring their success. Richards noted that over the last two and half years, she’s begun to work more closely with school communities – everything from K-12 districts up through colleges – than ever before in her career, largely to focus on bicycle and pedestrian issues. Electric scooters are also a “hot topic” right now as cities and states seek to “organize” their deployment better, she noted “Should they be restricted to bike lanes? Should they be allowed to use the sidewalks? And what places can they use to park? Those are all brand new issues,” Richards said. Registration for this webinar is available here. After registering, you will receive a confirmation email containing information about joining the webinar. Please contact AASHTO’s Sofie Rhoads, associate program manager for environment, with any questions.